Catherine writes, "I have enclosed a picture of Maddy in her favorite spot. On our screened in porch, in the sun on her favorite swinging chair. "I adopted Maddy eight years ago when she was nine. She is now 16 and a half. She has been a sweet and loving cat and is doing well. Her kidneys are not the best, but she keeps on going! I love her dearly. But she is a man's cat. As soon as I got married and my husband and stepson moved in, Maddy claimed my stepson as hers. She slept with him, sat in his lap and clearly favored him above all others. Now that he has moved out of the house, She has come back to me, but still, I think likes my husband best. Could be that glass of milk before bed every night that he gives her that does it. "Maddy is now part of a large family. We have two dogs and two other cats as well. She is the queen of them all and clearly runs the house. For however long we have her, she is loved!" 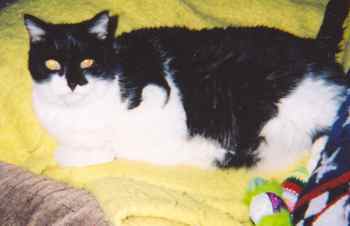 Pat writes, "A trip to a Nashua pet store for some fish food on a cold afternoon in December of 1994 and an introduction to Kitty Angels changed our lives. I was cat-less at that time. On that day, the fish food and a four-year-old female cat named Smokey came home with me. I changed her name to 'Miss Kitty'. For a year it was just she and I as confidants and companions. Then Mark moved in, and she fell for him almost as hard as I had. He changed her name to 'CB' (short for Cat Beast), he built her a cat 'condo' to play and sleep on, and she loved it all! For the next 8+ years it was the three of us, although she truly became his cat and I her servant. "CB was an amazing cat. She played fetch. Her favorite toy was a green rabbit's foot that she would carry around hinting at a game. She was a connoisseur. She could tell the minute you opened a bag of deli smoked turkey no matter where she was in the house. You could tell time by her. Every night for eight years she would come into the living room at the EXACT same time to let Mark know he should get ready for bed. She was a great listener. She'd sit and listen as I practiced presentations for Grad school and not interrupt once. She was a great companion. She would catnap with Mark in the afternoon and watch the late show with me. CB truly was an amazing cat and we miss her so very much. Thanks Kitty Angels for the miracles you work! (In Feb 2004, after 9+ years with her, we said our goodbyes to CB due to inoperable cancer)." Nihao (pronounced Nee-how) was adopted from Kitty Angels by Kirk and Cheryl in 1988 as a 12 week old kitten. She was chosen as she was the one in the litter who decided the best way to keep out of the way was to sit on the top of Kirk's foot. She has since seen a bit more of the world then she anticipated, as she moved from Nashua NH to St. Albans in England when she was just a year old. She now lives with two adopted sisters, Porter and Stout. In the photo Nihao is now 16 years old and her sisters are 3 years. As you can tell they get along famously. 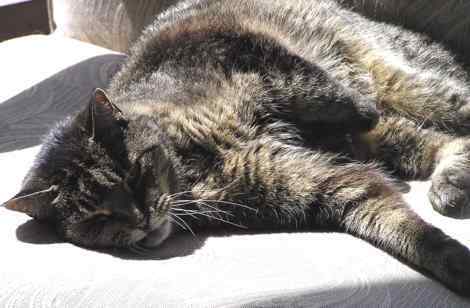 Nihao is working towards being the oldest cat in Britian, but has a way to go yet, as the current record holder is 34 years old. 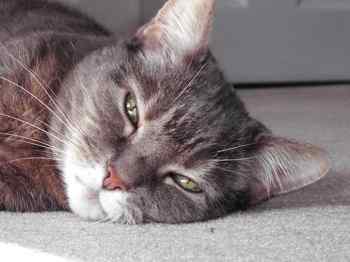 October 2008: Cheryl writes, "Sadly I must tell you that Nihao, whom we adopted from you, has died at the age of 20 years. She was very happy til the end when her heart just gave out. We will miss her. 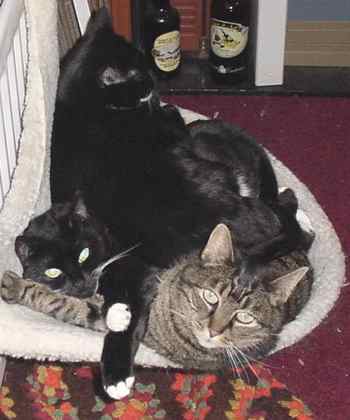 Thank you for all you hard work in adopting out cats to give people joy." 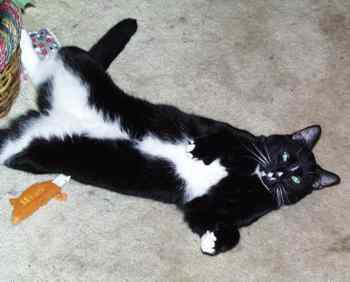 Hoffey was adopted in February 2004 by Jennifer, who writes, "He is such an angel. He loves to play on the cat towers I have and also the tunnels. He is adjusting very well with his new 'sister' Bianca and new 'brother' Little E. He is also now adjusting to a baby 'sister' Ribbsie. Hoffey loves his new home. He rolls onto his back for a belly rub and loves to be brushed. He is a wonderful addition to our family."